^ a b Sawyer, T.J., "Burroughs 205 HomePage"
^ Enslow, Philip H., Jr., "Multiprocessor Organization - A Survey", Computing Surveys, Vol. 9, March 1977, pp.103-129. ^ "Marlin Equity Partners acquires elements of Unisys payment systems", Burroughs press release, February 3, 2010. ^ Burroughs Payment Systems website. "The re-emergence of a company brand that began over 100 years ago solidifies our commitment to provide innovative solutions to your business needs. 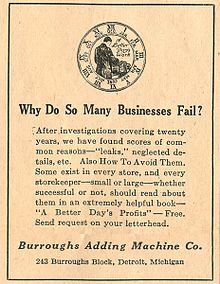 Back then, the introduction of Burroughs adding machines simplified daily operations for thousands of corporations. Today, our focus on payment systems related technologies and services has resulted in countless efficiencies for financial institutions and businesses alike who process check and cash transactions." Gray, George. "Burroughs Third-Generation Computers", Unisys History Newsletter, Volume 3, Number 5, October 1999. Wilner, Wayne T., "B1700 Design and Implementation", Burroughs Corporation, Santa Barbara Plant, Goleta, California, May 1972. Burroughs Corporation Records Charles Babbage Institute, University of Minnesota, Minneapolis. Oral history interview with Isaac Levin Auerbach Charles Babbage Institute, University of Minnesota. Oral history interview with Carel Sellenraad Charles Babbage Institute, University of Minnesota. Oral history interview with Ovid M. Smith Charles Babbage Institute, University of Minnesota.